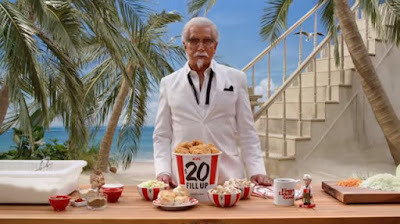 The Colonel count just keeps going up at KFC as they tap yet another actor to play Colonel Sanders heading into the summer. This time, they've hired George Hamilton to play a very tan Extra Crispy version of the Colonel to play up the summer theme and increase awareness of their Extra Crispy fried chicken. According to the chain's research, more than 50% of American don't know that the chain offers both Original Recipe and Extra Crispy fried chicken.